After many years of people hoping and waiting, NASA has announced that a new mission to Europa has successfully completed its first major review by the agency and now is entering the development phase, known as formulation. In other words, we are finally going back to Europa! Europa is considered one of the best places elsewhere in the Solar System to search for evidence of alien life, with its underground salt water ocean. With salt water, a rocky sea floor, and the energy and chemistry provided by tidal heating, Europa is thought to have the ingredients necessary for life of some kind. 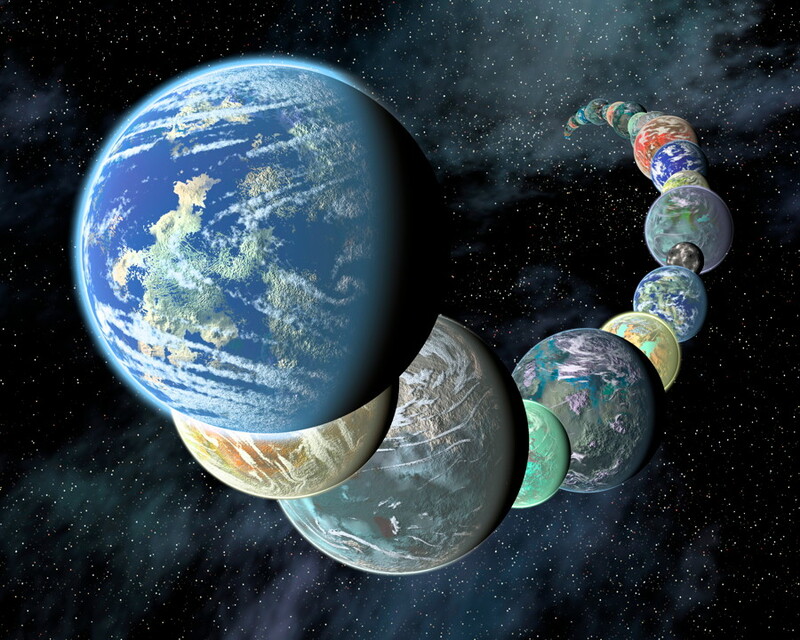 Whether there actually is anything alive there is, of course, the big question. Plasma Instrument for Magnetic Sounding (PIMS) – principal investigator Dr. Joseph Westlake of Johns Hopkins Applied Physics Laboratory (APL), Laurel, Md. This instrument works in conjunction with a magnetometer and is key to determining Europa’s ice shell thickness, ocean depth, and salinity by correcting the magnetic induction signal for plasma currents around Europa. Interior Characterization of Europa using Magnetometry (ICEMAG) – principal investigator Dr. Carol Raymond of NASA’s Jet Propulsion Laboratory (JPL), Pasadena, Calif. This magnetometer will measure the magnetic field near Europa and – in conjunction with the PIMS instrument – infer the location, thickness, and salinity of Europa’s subsurface ocean using multi-frequency electromagnetic sounding. Mapping Imaging Spectrometer for Europa (MISE) – principal investigator Dr. Diana Blaney of JPL. This instrument will probe the composition of Europa, identifying and mapping the distributions of organics, salts, acid hydrates, water ice phases, and other materials to determine the habitability of Europa’s ocean. Europa Imaging System (EIS) – principal investigator Dr. Elizabeth Turtle of APL. The wide and narrow angle cameras on this instrument will map most of Europa at 50 meter (164 foot) resolution, and will provide images of areas of Europa’s surface at up to 100 times higher resolution. 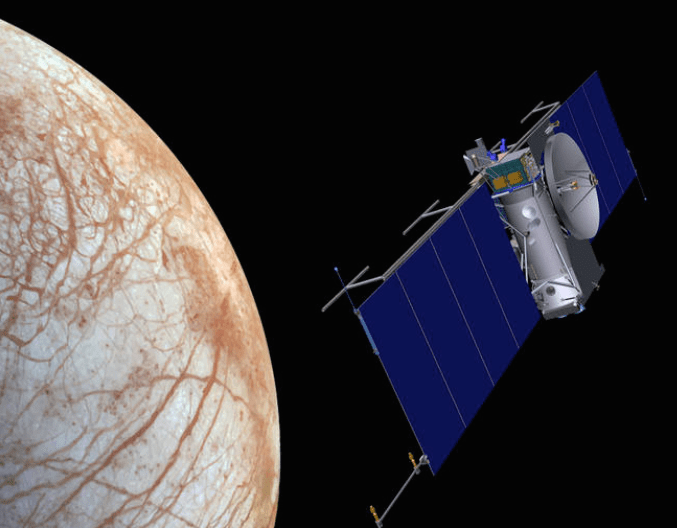 Radar for Europa Assessment and Sounding: Ocean to Near-surface (REASON) – principal investigator Dr. Donald Blankenship of the University of Texas, Austin. This dual-frequency ice penetrating radar instrument is designed to characterize and sound Europa’s icy crust from the near-surface to the ocean, revealing the hidden structure of Europa’s ice shell and potential water within. Europa Thermal Emission Imaging System (E-THEMIS) – principal investigator Dr. Philip Christensen of Arizona State University, Tempe. This “heat detector” will provide high spatial resolution, multi-spectral thermal imaging of Europa to help detect active sites, such as potential vents erupting plumes of water into space. MAss SPectrometer for Planetary EXploration/Europa (MASPEX) – principal investigator Dr. Jack (Hunter) Waite of the Southwest Research Institute (SwRI), San Antonio. This instrument will determine the composition of the surface and subsurface ocean by measuring Europa’s extremely tenuous atmosphere and any surface material ejected into space. Ultraviolet Spectrograph/Europa (UVS) – principal investigator Dr. Kurt Retherford of SwRI. This instrument will adopt the same technique used by the Hubble Space Telescope to detect the likely presence of water plumes erupting from Europa’s surface. UVS will be able to detect small plumes and will provide valuable data about the composition and dynamics of the moon’s rarefied atmosphere. SUrface Dust Mass Analyzer (SUDA) – principal investigator Dr. Sascha Kempf of the University of Colorado, Boulder. This instrument will measure the composition of small, solid particles ejected from Europa, providing the opportunity to directly sample the surface and potential plumes on low-altitude flybys. 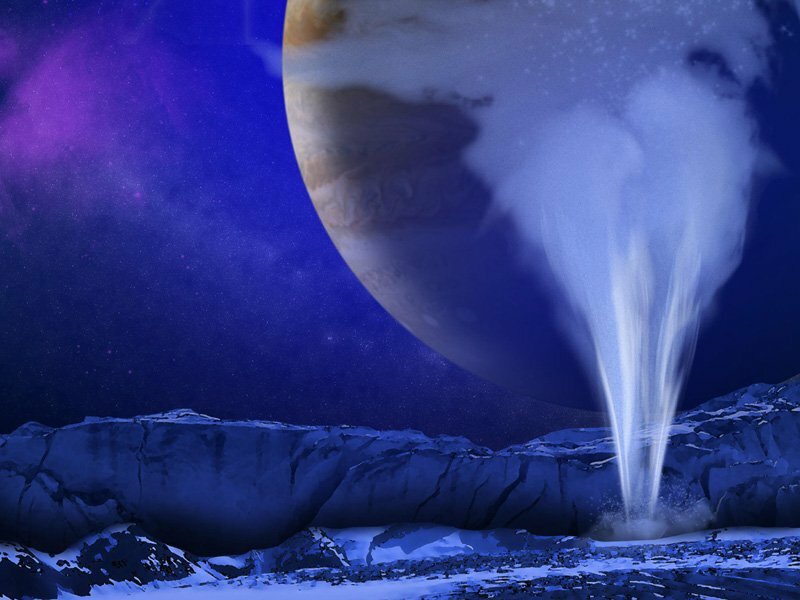 Observations by the Hubble Space Telescope have provided evidence for geysers on Europa, something like those on Saturn’s moon Enceladus, but verifying them has been difficult. If they do exist, Europa Clipper could fly through them and sample them, just as Cassini has already done at Enceladus. That would be a way to sample some of the water without having to drill through the ice, since the water from the ocean is thought to make its way to the surface through the many cracks in the ice shell. The mission will also help pave the way for future orbiters or landers on Europa. Even more ambitious ideas include an ice-penetrating probe which could then swim in the ocean like a small submarine. Until then, Europa Clipper should provide additional much-needed knowledge about the conditions inside Europa and how habitable it is. More information about Europa is available here.